The city fathers of the time may have taken this comment to heart as around 1883 trees were planted in the cut (later New Road) between North Street and Church Street.The Steine and the area now known as the Valley Gardens were still in a very poor state becoming little more than marshland in winter and considered a source of shame for Brighton. In 1817 improvements to these areas were considered and a subscription list started with the Prince of Wales leading by example with a donation of £300 ensuring that the scheme progressed.The Prince’s own gardener was responsible for the laying out of the scheme and the physical works and the planting of saplings from the Stanmer Estate, gifted by the Earl of Chichester were carried out by local pauper labour. Around 1820 the tree cover surrounding ‘Sylvan Lodge’ and ‘Ditchling Cottage’ was planted and in the same year some twenty-one trees were planted in the grounds of St Peter’s Church. continued unabated.The North Level, (now The Level) a large unkempt area of common land used for the free drying of laundry and for horse grazing was planted with several hundred Elm trees and five years later saw a substantial number of Elms planted in Elm Grove, the first of the local thoroughfares to receive tree planting on both sides. day.The City is constantly subjected to oceanic winds from the southwest and these contain a high saline content picked up while in passage over the sea. This can result in growth tip die-back of new growth and tends to have a debilitating affect on many tree species.The fact that Elms are recorded growing in Brighton prior to 1800 indicates that the species are hardy enough to cope and thrive in thin loam over virgin chalk and able to withstand this often harsh coastal environment. likely have been fully aware of these important characteristics and would have wisely selected Elm in their efforts to green what has now become the City. These factors help to illustrate the reasons for the high dependency on Elm in the City, its connections with effective Elm Disease control and its rightful place as holder of‘ 'TheNational Collection of Ulmus’. J R B Evison (Ray) in his period of employment as Director of the Parks and Gardens Department from 1951 had a great interest in Elm and can be credited with obtaining a number of varieties and cultivars from liaisons with friends and colleague abroad and ultimately planted locally. Of specific interest is the relationship with Hans Heijbroek a botanist and geneticist who was carrying out extensive studies with the genus Ulmus at the Dorschkamp Research Institute of Forestry and Environmental Planning in Wageningen, Holland. The liaison saw Brighton receive graftwood from several of the Dutch bred clones then available even though Evison preferred the Huntingdon Elm, Ulmus x hollandica ‘Vegeta’ that features heavily in the Cities streets today. 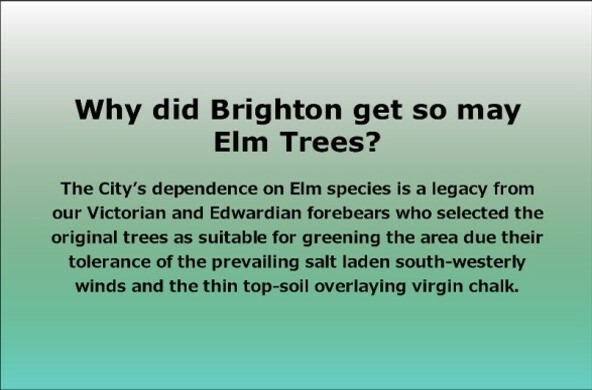 Brighton and Hove today can be likened to a living museum in that the city now holds the only significant population of Elm in England, some of the most noticeable individual Elms in Europe.Collectively these form the National Collection of Ulmus. This prestigious accolade must be shared by many of the Councillors, Senior Managers, Arboriculturists, colleagues, members of the public, volunteers and local contractors who in their own way have all contributed to the successful Elm Disease Control programme that has in turn seen the retention of these fine trees against all odds.